scheduled for publication at $23.95 on March 29, 2001. Possibly the most objective of a bad bunch. 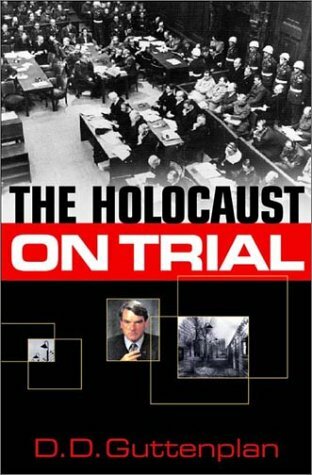 Guttenplan distinguished himself by an excellent book-length article published before on the trial in The Atlantic Monthly. David Irving has no plans to write a history of the court actions. "To his admirers, British author David Irving is one of the world's preeminent military historians. Scholars of World War II have described his biographies of Hitler, Rommel, Göring, and Goebbels as essential reading. But there is a dark side to these best-selling books as well, starting with the author's denial of Hitler's responsibility for the extermination of European Jewry and ending with his claim that the Holocaust never happened. Deborah Lipstadt, an American academic, blew the whistle on Irving. Her book, Denying the Holocaust, describes him as a right-wing extremist who denigrated the memory of Hitler's victims. Irving sued for libel in England, where libel laws are famously biased in favor of the plaintiff. It was up to Lipstadt to prove the truth of what she wrote, and to prove, along the way, that hundreds of thousands of Jews were indeed gassed to death at Auschwitz. D. D. Guttenplan's brilliant coverage of this high-stakes duel, based on exclusive access to many of the participants, makes compelling reading and raises surprising questions about what we know, or can know, about history." Page 163: "After the trial; Richard Evans . . . said this had been deliberate," i.e., that "the defence had somehow assembled a team consisting of" five non-Jews. Guttenplan adds a footnote effectively calling Evans a liar: "Evans made this observation at a public forum on the trial sponsored by the Wiener Library in London. The next morning I received a telephone call from Anthony Julius, who also spoke. . . Julius assured me that Evans was mistaken." Page 222: "The defence does get one lucky break. Early on, Irving asks Evans if he was 'shown at any time any law report that had been produced by Penguin Books in this country, any libel reading [or] report on [Lipstadt's] book.' When Evans, quite truthfully, answers 'No,' Irving drops the matter. He never asks -- and Evans never volunteers -- any information about the book's American libel reading. If he had, and if Evans had seen the American Publisher's report, the resulting disclosure . . . could have seriously embarrassed the defence." MR IRVING: When you were engaged to write this expert report, were you shown at any time any law report that had been produced by Penguin books in this country, any libel reading report on the book, on the book that is complained of? Q. When your books are published in the United Kingdom, your own books, are they subjected to a legal reading to see if they libel anyone? Evans. Not that I have ever been aware of. Q. So, to your knowledge, therefore, as far as you know, there was no report prepared by any firm of lawyers, reputable lawyers, on the book before it was published? Evans. All I can say is that I did not see any such report. I cannot answer as to whether there was one or not.